I love that our mission here at Mission Adelante is to “make disciples by serving, sharing life and sharing Jesus with people from all places.” This declaration puts the development of a community that grows in faith and produces disciples of Christ in the center of everything we do. Each program of Mission Adelante is a powerful channel for sharing life with people who don’t know the Lord and with others who already have a personal relationship with Him. Our Latino Ministry Community has been very blessed through the years with the deep relationships we have experienced. The outreach services we offer at Mission Adelante have opened doors for friendships that have lasted through the years, and we can say that we have grown a lot in our knowledge of the Lord Jesus Christ. 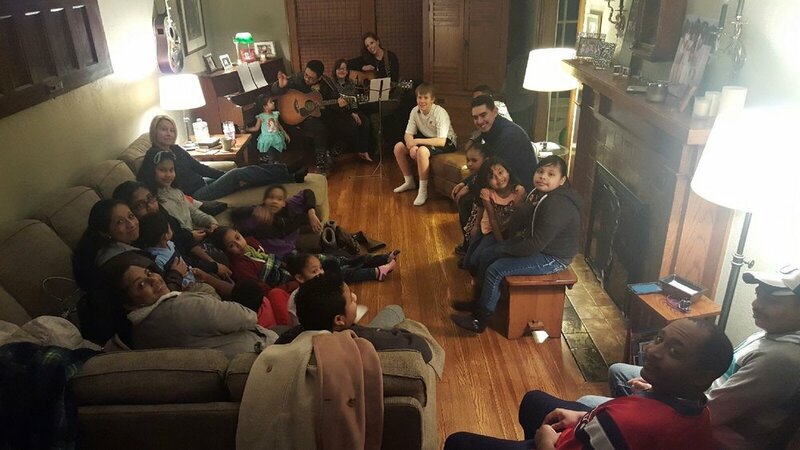 Currently, our Latino community gathers in three house churches with many people who met through their involvement in our ESL, Kids Adelante and Teens Adelante programs. It’s a beautiful challenge we enjoy as we embrace the cultural differences we have being from different countries: Mexico, Costa Rica, Honduras, El Salvador, Cuba, and the U.S. I have learned so much about others, about myself, and about how much we need Jesus in our relationships through sharing life with people from so many different places. When we meet for church, we gather in different houses the second and fourth Sundays of each month. We eat a meal together, we sing, and we study the Bible. The first and third Sundays, we have a worship service at Mission Adelante and this is our opportunity to share life together as a whole family in a larger group. We provide a comfortable space for people who don’t yet know the Lord or who are new in the faith to feel a sense of trust and to be able to be vulnerable and sincere in their walk with Christ. Our community and our gathering together are examples of what can happen when we serve, share life, and share Jesus with others, through everything we do. Attention Coffee Lovers: If you love good coffee and helping immigrants and refugees, check out the fundraiser that Messenger Coffee is sponsoring for Mission Adelante. 100% of the profits go to support our immigrant and refugee programs at Mission Adelante. Visit http://messengercoffee.co/collections/mission-adelante-fundraiser, for more information and while you are at the website, order a bag or two of great coffee for a great cause. Adelante Thrift is in need of donations: We are running low on clothing in all sizes and genders, linens, furniture, houseware items, and electronics. If you are having a garage sale or doing Spring cleaning, consider donating your gently used items to Adelante Thrift, located at 3720 State Ave. Kansas City, KS 66102. Donations are accepted Monday - Saturday 9:00 a.m. to 6:00 p.m.